In the past, I have encouraged you to submit your data visualizations on subjects that are important to you as well as would provide awareness to the rest of us. Anna Kukelhaus Dynan, from The National Geographic Society, sent me an important graphic that National Geographic magazine has put together. It is a very insightful graphic regarding hunger in America, specifically on what a “food desert” (areas where households lack a car and are located more than half a mile from a supermarket) looks like. The graphic, below, running in this month’s issue of National Geographic magazine, along with a feature story on “The New Face of Hunger” (part of their 8 month series on issues of food security and sustainability), which depicts the food desert that is Houston, Texas (affecting 43,000 households). The graphic is startling, as the average person may not realize that the typical hungry American is not necessarily homeless, but employed, with a cell phone, and other “stuff.” The feature article explores why and how people become food insecure, a topic that recently made headlines due to The Washington Post article about the mother who drove her Mercedes to pick up food stamps. I am honored that Anna reached out to me to run this graphic. This is a critical issue in America today that we all need to be aware of. As the face of hunger has changed, so has its address. The town of Spring, Texas, is where ranchland meets Houston’s sprawl, a suburb of curving streets and shade trees and privacy fences. The suburbs are the home of the American dream, but they are also a place where poverty is on the rise. As urban housing has gotten more expensive, the working poor have been pushed out. Today hunger in the suburbs is growing faster than in cities, having more than doubled since 2007. Yet in the suburbs America’s hungry don’t look the part either. They drive cars, which are a necessity, not a luxury, here. Cheap clothes and toys can be found at yard sales and thrift shops, making a middle-class appearance affordable. Consumer electronics can be bought on installment plans, so the hungry rarely lack phones or televisions. Of all the suburbs in the country, northwest Houston is one of the best places to see how people live on what might be called a minimum-wage diet: It has one of the highest percentages of households receiving SNAP assistance where at least one family member holds down a job. The Jefferson sisters, Meme and Kai, live here in a four-bedroom, two-car-garage, two-bath home with Kai’s boyfriend, Frank, and an extended family that includes their invalid mother, their five sons, a daughter-in-law, and five grandchildren. The house has a rickety desktop computer in the living room and a television in most rooms, but only two actual beds; nearly everyone sleeps on mattresses or piles of blankets spread out on the floor. Though all three adults work full-time, their income is not enough to keep the family consistently fed without assistance. The root problem is the lack of jobs that pay wages a family can live on, so food assistance has become the government’s—and society’s—way to supplement low wages. The Jeffersons receive $125 in food stamps each month, and a charity brings in meals for their bedridden matriarch. 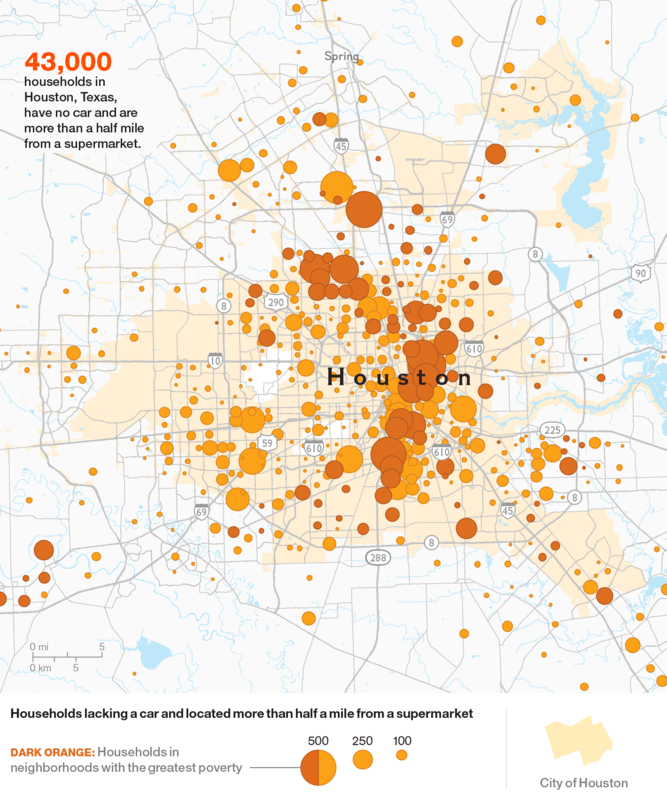 Tens of thousands of people in Houston and in other parts of the U.S. live in a food desert: They’re more than half a mile from a supermarket and don’t own a car, because of poverty, illness, or age. Public transportation may not fill the gap. Small markets or fast-food restaurants may be within walking distance, but not all accept vouchers. If they do, costs may be higher and nutritious options fewer. Christian works as a home health aide, earning $7.75 an hour at a job that requires her to crisscross Houston’s sprawl to see her clients. Her schedule, as much as her wages, influences what she eats. To save time she often relies on premade food from grocery stores. “You can’t go all the way home and cook,” she says. On a day that includes running a dozen errands and charming her payday loan officer into giving her an extra day, Christian picks up Ja’Zarrian and her seven-year-old, Jerimiah, after school. As the sun drops in the sky, Jerimiah begins complaining that he’s hungry. The neon glow of a Hartz Chicken Buffet appears up the road, and he starts in: Can’t we just get some gizzards, please? Christian pulls into the drive-through and orders a combo of fried gizzards and okra for $8.11. It takes three declined credit cards and an emergency loan from her mother, who lives nearby, before she can pay for it. When the food finally arrives, filling the car with the smell of hot grease, there’s a collective sense of relief. On the drive back to the shelter the boys eat until the gizzards are gone, and then drift off to sleep. Tracie McMillan is the author of The American Way of Eating and a Senior Fellow at the Schuster Institute for Investigative Journalism at Brandeis University. Photographers Kitra Cahana, Stephanie Sinclair, and Amy Toensing are known for their intimate, sensitive portraits of people. Maps and graphics by Virginia W. Mason and Jason Treat, NGM Staff. Help for the Hungry, sources: USDA; Food Research and Action Center; Center on Budget and Policy Priorities. Stranded in a Food Desert, sources: USDA; City of Houston; U.S. Census Bureau. Crop Subsidies, research: Amanda Hobbs. Sources: Mississippi Department of Human Services; Environmental Working Group; National Cancer Institute. Next Post Infographic: The Ebola Virus: Are You at Risk?